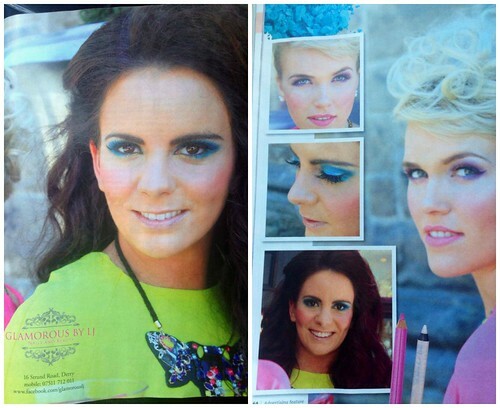 A few weeks ago I did a photoshoot with a fab new beauty salon in Derry/Londonderry called “Glamorous by LJ” which appeared in “Local Women” Magazine. Laura-Jane, Proprietor of the salon, is one talented lady and I was delighted with the results of the make-up that she applied. When she came at me with blue eye shadow, I almost had a heart attack but when I saw the end result I couldn’t believe how funky she made it look. When matched with my quirky hairstyle by Micky @ RoCo Hairdressing and the trendy neon styling, I absolutely loved the entire look. “Glamorous by LJ” is located at 16 Strand Rd, Derry/Londonderry and is definitely worth a look! Her prices are amazing with spray tans and gel nail polishes from as little at £10. It is the ideal place to get yourself beach ready this Summer and all at extremely affordable prices!